Gunpoint, the sole release by Suspicious Developments, is a modern film-noir platform puzzler with strong stealth elements. If you’re interested in a game that tests your skills of foresight and timing then read on. 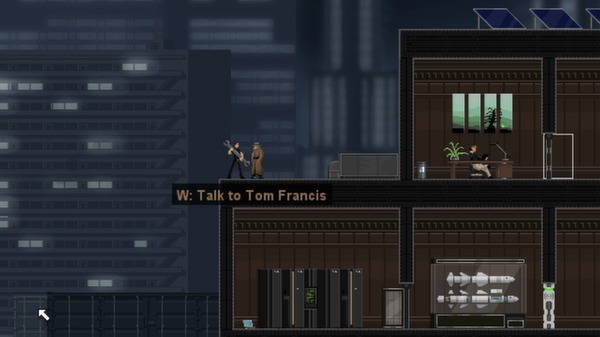 In Gunpoint you play as professional spy Richard Conway who is almost immediately framed for the murder of his new employer. The game-play is focused around two primary elements, one being the pair of bullfrog jump pants you receive in the opening sequence, and the other being the Cross-link electronics hacking system you purchase later as an upgrade. The pants allow you to jump in arcs around the map and through windows in order to get the drop on the guards in various buildings you’re attempting to break into. The cross-link will allow you to re-wire the utilities of a building so that, for instance, you can set a light switch to open security doors or make security hand-print scanners activate a trap without their knowing as they come to check out a noisy disturbance you’ve caused to get their attention. Along the way you’ll meet several people who will give you jobs primarily focused on espionage and the acquisition of of data from various corporations to be used for less than scrupulous reasons. Naturally, humor is a very consistent feature in these communications so you get to choose whether you accept these jobs with suspicion, stoic acquiescence, or bitter snark. Outside of the main story-line to clear your name of the aforementioned framing, there’s everything from manipulating police records, corporate espionage, and every other type of cyber-cryptological tomfoolery. On the outset Gunpoint is a very unique game. Players familiar with stealth action games will immediately fall in step with the game’s premise, coming up with convoluted methods to sneak around undetected. Or, for the less patient, more direct methods such as, say, punching guards repeatedly in the face is just as legitimate a tactic. You’re graded on both for mission ratings but either is just as valid. 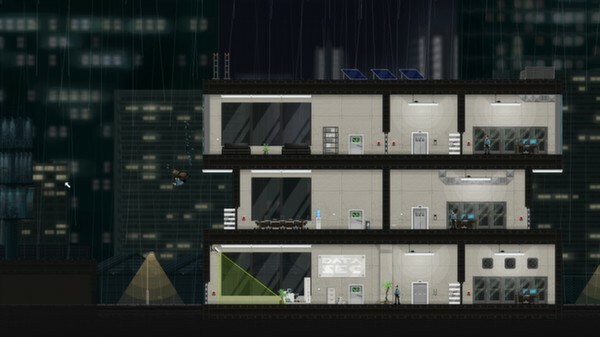 What really makes the game stand out is the ability to hack the wiring in any given building to use the guards’ logic against them, causing them to lock themselves in out-of-the-way rooms and preventing them from reaching you as you hack into the building’s computers. The atmosphere is great and very unique for the genre. Slow jazz tunes haunt the backgrounds of the levels and menus, it rains regularly adding to the film-noir feel, and all of the classic detective movie tropes come together to form an elegant and humorous package. The only downsides are that the game-play gets incredibly repetitive very quickly, as there’s only so many ways to slam a door shut on a guard. And really, there’s only a few upgrades you need in the game to totally break it down into an easy run through. If you’re looking for a fun quirky twist on the stealth genre then definitely pick up a copy of Gunpoint. Its fresh approach and unique environment deserves all of its accolades, and then some. For a first release, Suspicious Developments has really outdone themselves and will be worth watching for as time goes on. Buy Gunpoint on Steam here. Visit the Main Gunpoint site here.